Loyalty programs can be a highly effective way to build brand loyalty and encourage new brand advocates. From periodic discounts or rewards for promoting the brand, membership certainly has its benefits. And no one benefits more than the brand. But there is much more that a brand can do with loyalty programs and much more to be gained - including increasing time-on-site, page views, ad impressions and click-throughs, and direct sales. Let's take a look at one such loyalty program, offered by Chicago radio station WXRT, at 93.1 FM and www.wxrt.com. Their program is called the VIP Lounge and features several outstanding uses of brand loyalty. 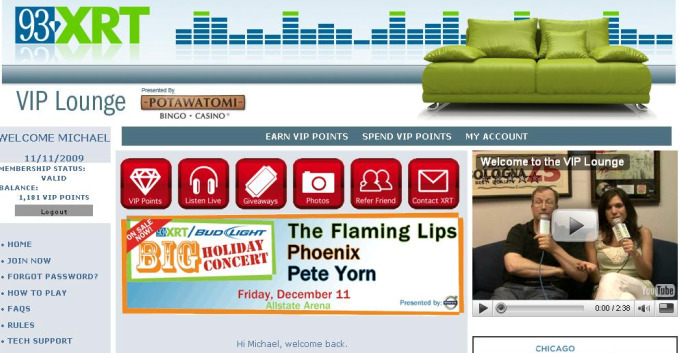 Below is an image of the home page after logging-in to the VIP Lounge. We first see the brand, clear and present, with the identifiable moniker of "93 XRT" and call-sign diamond in the logo. The page is immediately inviting as a place to relax and spend some time exploring - a nice touch with the couch and a personalized invitation with the welcoming video. Of course, the VIP's name is prominent, as is his or her status and balance of VIP points. Altogether, the user is made to feel very welcome and encouraged to explore the brand (more on that later). VIP points are earned by interacting with the website and the radio station offline. The points can then be spent on promotional items - such as tickets to concerts or passes to events. For example, one entry for a free ticket to a local concert might "cost" 10 points. It's then up to the user to decide how many points to spend - the more points spent, the more entries and better chance of success to win the tickets. Instead of simply shipping a product when the user reaches a certain threshold, the user is given control of their loyalty. This gives them a reason to get excited and, more important, to come back and keep trying. Users can also spend their points on merchandise. Options. Let's now look at one way for users to earn points. To the right is an image of blues legend BB King, who will be making an appearance at Chicago's House of Blues, a WXRT-sponsored event. On that photo is a call-to-action - 250 VIP points using the keyword "BB." By entering this code in the "Spend VIP Points" section at the VIP Lounge, the user earns 250 points that they can use to enter to win tickets to any number of WXRT concerts including BB King. Synergy. Sure, we want our users to benefit from loyalty programs. More important, however, our brands and our bottom line needs to benefit. Going back to the VIP Lounge home page, we can see several important branding elements and opportunities. The most striking element of the page is designed first and foremost for brand interaction - the red buttons. There are links to earning and spending VIP points, listening to the radio station live (cross-channel promotion), 'giveaways,' 'photos,' and the ever-important 'refer friend.' The referral is accomplished by an e-mail invite and rewarded by additional VIP points for each friend referred, and 10 percent of VIP points earned by those friends within the first seven days of their signup. In other words, the user becomes a loyalty program affiliate. Brilliant. There is also a prominent 'contact' button. After all, what good is being a VIP if you don't get personalized VIP treatment? Also highly visible are a few direct revenue generators; in the casino ad, the "Big Holiday Concert" ad and another casino ad at the very top of the page (not pictured). One of the most imporant features of this page and the VIP Lounge in general is the benefit to the website's statistics, which become highly relevant to prospective advertisers. By the time you reach the VIP Lounge you've already created a few page views. The multiple interactions available also encourage more page views and increased time-on-site, including photos and the video welcome message. Now, back to the BB King photo - this was the last of at least two dozen photos in the gallery. The gallery is promoted as offering 250 VIP points by looking for the keyword. So, the user must click through many other photos before reaching the last one, containing the keyword "BB." That's a tremendous way to get people to spend more time on the page, while giving something in return and even entertaining them. Of course, a successful loyalty program requires promotion and maintenance. WXRT has more than 12,000 Facebook Fans and over 3,300 Twitter followers. 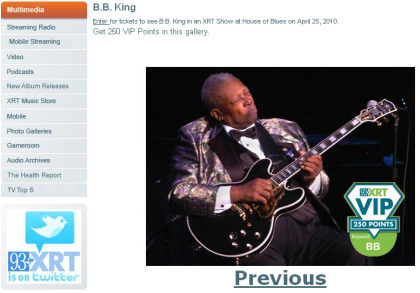 The BB King promotion (along with all the others) are promoted heavily through both channels. Viral Marketing. It should be noted that WXRT is no stranger to brand loyalty. The purveyors of "Chicago's Finest Rock" have been building a community and a following of Chicago music fans since about 1972. They have enjoyed loyal fans well before the Web had any impact on business, or even existed. But these elements are a fine example of brand loyalty objectives, benefits, and strategies that any business can employ.